Education Secretary Rebecca Holcombe addresses the House Education Committee in January about the need to consolidate school districts. When Rep. Dave Sharpe (D-Bristol) drops by the four town meetings in his Addison County district this week, he’ll have some selling to do. The House Education Committee he chairs passed a bill late last week that will force school districts in those towns to pair up with their neighbors by 2019. The goal is to offer more complete educational opportunities and save money. “The challenge for this committee was to find ways to deliver better education more efficiently at a lower cost," Sharpe said Friday. "We took it on." His committee unanimously passed legislation late Thursday that would require Vermont’s 277 school districts to consolidate into fewer districts with at least 1,100 students each (for reference, Montpelier currently has 988, Burlington 4,104). The bill provides incentives for schools to consolidate, while phasing out the small school grants that have sustained institutions with declining enrollment. More immediately, the bill would cap per-pupil spending increases at no more than 2 percent for the next three years. The bill comes in response to discontent across the state over rising school taxes, which led to the defeat last year of dozens of school budgets. Though the education committee’s four Republicans voted for the bill, it is likely to face greater opposition on the House floor. Rep. Don Turner (R-Milton), the minority leader, declined to give his blessing Friday, nixing a bipartisan press conference intended to champion the bill on the eve of Town Meeting Day. There will also be those who say it goes too far and eliminates local control. Sharpe said estimates indicate that school consolidation will save $25 million to $50 million a year once districts are done merging in four years. The more immediate cap on per-pupil spending could cut $37 million from districts that exceed the limit. But Sharpe’s committee did not examine town-by-town estimates for the cap before passing the bill, nor are towns likely to have that information in hand at this week's town meetings. When Sharpe's committee looked at how an earlier version of the spending cap would affect each town, the proposal fell apart within an hour, he said. 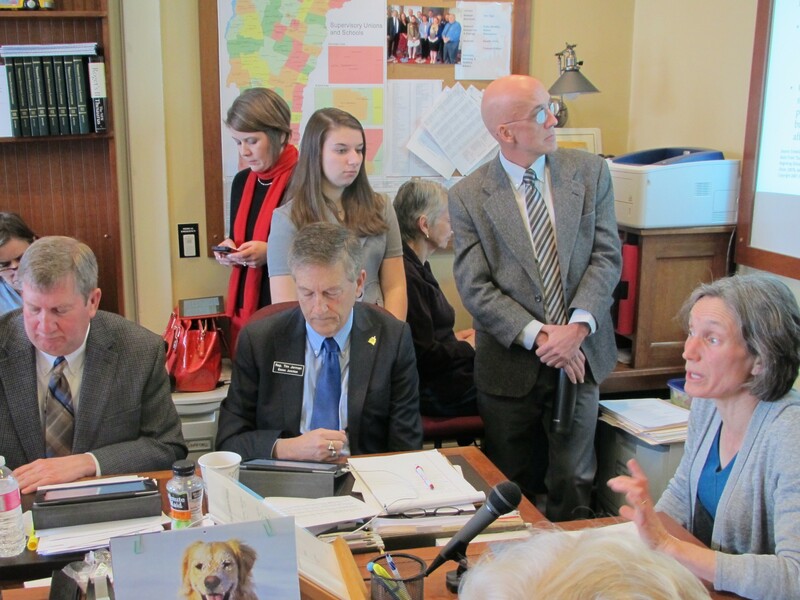 In Montpelier, education reform legislation tends lose support when legislators' school districts learn how they will be affected. Sharpe said he anticipates the House Ways and Means Committee will continue to tweak the spending before the bill goes to the House floor after town meeting. Meanwhile, he’ll defend the concept of larger school districts at town meetings in Starksboro, Bristol, Lincoln and Monkton. Preliminary figures show that Starksboro, Monkton and Mount Abraham Union High School would exceed the 2 percent per-pupil spending cap if it were in place this year. Sharpe said he’ll make the argument that if they all come together in one school district, none would exceed the cap. He believes all the towns in his district would be able to keep their small schools while offering more opportunities. Rep. Sarah Buxton (D-Tunbridge), another committee member, will be trying to sell Tunbridge and South Royalton on the bill this week, too. Tunbridge is slated to see a kindergarten class of just seven students next year, she said. “I anticipate a new configuration,” she said, if the bill passes. To meet the bill’s 1,100-student minimum, 10 towns in a 40-mile radius in her area would have to join together, she said. House Speaker Shap Smith (D-Morristown) will have the same sell to make in the towns he represents. Preliminary figures show Morristown and Elmore exceeding the cap. He’s ready to tell them that voters asked for legislators to make school funding more sustainable. “This works to do that,” he said. How that goes over is anybody’s guess. “I don’t know whether people will be grumpy at town meeting," he said. "They were last year."